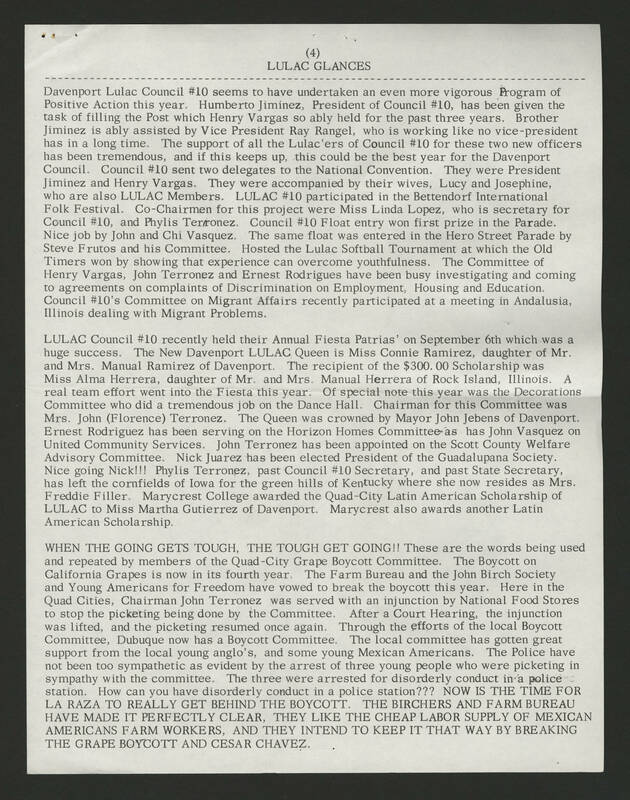 (4) LULAC GLANCES Davenport Lulac Council #10 seems to have undertaken an even more vigorous Program of Positive Action this year. Humberto Jiminez, President of Council #10, has been given the task of filling the Post which Henry Vargas so ably held for the past three years. Brother Jiminez is ably assisted by Vice President Ray Rangel, who is working like no vice-president has in a long time. The support of all the Lulac'ers of Council #10 for these two new officers has been tremendous, and if this keeps up, this could be the best year for the Davenport Council. Council #10 sent two delegates to the National Convention. They were President Jiminez and Henry Vargas. They were accompanied by their wives, Lucy and Josephine, who are also LULAC Members. LULAC #10 participated in the Bettendorf International Folk Festival. Co-Chairmen for this project were Miss Linda Lopez, who is secretary for Council #10, and Phyllis Terronez. Council #10 Float entry won first prize in the Parade. Nice job by John and Chi Vasquez. The same float was entered in the Hero Street Parade by Steve Frutos and his Committee. Hosted the Lulac Softball Tournament at which the Old Timers won by showing that experience can overcome youthfulness. The Committee of Henry Vargas, John Terronez and Ernest Rodrigues have been busy investigating and coming to agreements on complaints of Discrimination on Employment, Housing and Education. Council #10's Committee on Migrant Affairs recently participated at a meeting in Andalusia, Illinois dealing with MIgrant Problems. LULAC Council #10 recently held their Annual Fiesta Patrias' on September 6th which was a huge success. The new Davenport LULAC Queen is Miss Connie Ramirez, daughter of Mr. and Mrs. Manual Ramirez of Davenport. The recipient of the $300.00 Scholarship was Miss Alma Herrera, daughter of Mr. and Mrs. Manual Herrera of Rock Island, Illinois. A real team effort went into the Fiesta this year. Of special note this year was the Decorations Committee who did a tremendous job on the dance Hall. Chairman for this Committee was Mrs. John (Florence) Terronez. The Queen was crowned by Mayor John Jebens of Davenport. Ernest Rodriguez has been serving on the Horizon Homes Committee as has John Vasquez on United Community Services. John Terronez has been appointed on the Scott County Welfare Advisory Committee. Nick Juarez has been elected President of the Guadalupana Society. Nice going Nick!!! Phylis Terronez, past Council #10 Secretary, and past State Secretary, has left the cornfields of Iowa for the green hills of Kentucky where she now resides as Mrs. Freddie Filler. Marycrest College awarded the Quad-City Latin American Scholarship of LULAC to Miss Martha Gutierrez of Davenport. Marycrest also awards another Latin American Scholarship. WHEN THE GOING GETS TOUGH, THE TOUGH GET GOING!! These are the words being used and repeated by members of the Quad-City Boycott Committee. The Boycott on California Grapes is now in its fourth year. The Farm Bureau and the John Birch Society and Young Americans for Freedom have vowed to break the boycott this year. Here in the Quad Cities, Chairman John Terronez was served with an injunction by National Food Stores to stop the picketing being done by the Committee. After a Court Hearing, the injunction was lifted, and the picketing resumed once again. Through the efforts of the local Boycott Committee Dubuque now has a Boycott Committee. The local committee has gotten great support from the local young anglo's, and some young Mexican Americans. The Police have not been too sympathetic as evident by the arrest of three young people who were picketing in sympathy with the committee. The three were arrested for disorderly conduct in a police station. How can you have disorderly conduct in a police station??? NOW IS THE TIME FOR LA RAZA TO REALLY GET BEHIND THE BOYCOTT. THE BIRCHERS AND FARM BUREAU HAVE MADE IT PERFECTLY CLEAR. THEY LIKE THE CHEAP LABOR SUPPLY OF MEXICAN AMERICANS FARM WORKERS, AND THEY INTEND TO KEEP IT THAT WAY BY BREAKING THE GRAPE BOYCOTT AND CESAR CHAVEZ.